The Corner Bookstore is a venture of the Friends of the Fairport Library. The store's inventory of gently used and collectible books donated by the local community are modestly priced. Proceeds support library programs. Volunteers staff the store. Stop in the store for a Volunteer Application. NOTE: You must be a member of the Friends to volunteer. Joining is easy. See the Donations Tab for donation policy details. Please limit donations to 2-3 bags\boxes per visit. If no answer (the store is closed or we are busy helping customers), please leave a message. BECOME A MEMBER of the Friends Group for just $5.00 per year. Members receive $3.00 off any purchase at The Corner Bookstore once per year with their paid membership. Just show your membership card. Fairport Public Library has to offer! 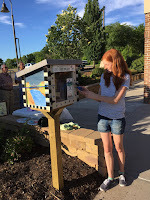 Jess Suiter, 8th grader from Fairport, NY completed her Girl Scout Silver Project in June 2016 by installing a Little Free Library at the Perinton Recreation Center. The project was sponsored by the Friends of the Fairport Public Library. The Corner Bookstore donates books as needed. Click "Membership Form" link below to join the Friends of the Fairport Public Library!